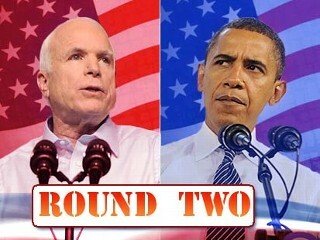 Title The Transcript of second McCain, Obama debate published to cocoa-touch. 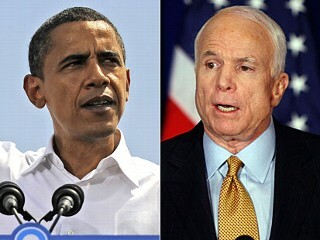 Presidential candidates John McCain and Barack Obama debated in Nashville, Tennessee, on Tuesday night. NBC's Tom Brokaw moderated the debate. Here is a transcript of that debate. 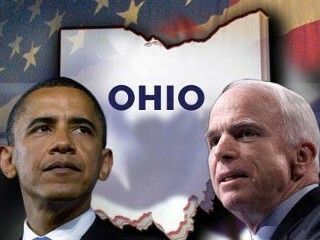 Sen. Barack Obama and Sen. John McCain meet in Nashville for their second debate. Brokaw: Good evening from Belmont University in Nashville, Tennessee. I'm Tom Brokaw of NBC News. And welcome to this second presidential debate, sponsored by the Commission on Presidential Debates. Tonight's debate is the only one with a town hall format. The Gallup Organization chose 80 uncommitted voters from the Nashville area to be here with us tonight. And earlier today, each of them gave me a copy of their question for the candidates. From all of these questions -- and from tens of thousands submitted online -- I have selected a long list of excellent questions on domestic and foreign policy. Neither the commission nor the candidates have seen the questions. And although we won't be able to get to all of them tonight, we should have a wide-ranging discussion one month before the election. Each candidate will have two minutes to respond to a common question, and there will be a one-minute follow-up. The audience here in the hall has agreed to be polite, and attentive, no cheering or outbursts. Those of you at home, of course, are not so constrained. The only exception in the hall is right now, as it is my privilege to introduce the candidates, Sen. Barack Obama of Illinois and Sen. John McCain of Arizona. Gentlemen? Gentlemen, we want to get under way immediately, if we can. Since you last met at Ole Miss 12 days ago, the world has changed a great deal, and not for the better. We still don't know where the bottom is at this time. As you might expect, many of the questions that we have from here in the hall tonight and from online have to do with the American economy and, in fact, with global economic conditions. I understand that you flipped a coin. And, Sen. Obama, you will begin tonight. And we're going to have our first question from over here in Section A from Allen Shaffer. Allen? Shaffer: With the economy on the downturn and retired and older citizens and workers losing their incomes, what's the fastest, most positive solution to bail these people out of the economic ruin? Obama: Well, Alan (ph), thank you very much for the question. I want to first, obviously, thank Belmont University, Tom, thank you, and to all of you who are participating tonight and those of you who sent e-mail questions in. I think everybody knows now we are in the worst financial crisis since the Great Depression. And a lot of you I think are worried about your jobs, your pensions, your retirement accounts, your ability to send your child or your grandchild to college. And I believe this is a final verdict on the failed economic policies of the last eight years, strongly promoted by President Bush and supported by Sen. McCain, that essentially said that we should strip away regulations, consumer protections, let the market run wild, and prosperity would rain down on all of us. It hasn't worked out that way. And so now we've got to take some decisive action. Now, step one was a rescue package that was passed last week. We've got to make sure that works properly. And that means strong oversight, making sure that investors, taxpayers are getting their money back and treated as investors. It means that we are cracking down on CEOs and making sure that they're not getting bonuses or golden parachutes as a consequence of this package. And, in fact, we just found out that AIG, a company that got a bailout, just a week after they got help went on a $400,000 junket. And I'll tell you what, the Treasury should demand that money back and those executives should be fired. But that's only step one. The middle-class need a rescue package. And that means tax cuts for the middle-class. It means help for homeowners so that they can stay in their homes. It means that we are helping state and local governments set up road projects and bridge projects that keep people in their jobs. Tom Brokaw of NBC, the moderator, screened their questions and also chose others that had been submitted online. "The Straight Talk Express lost a wheel on that one," he said. He said his plan would only tax those making more than $250,000 a year, and most small businesses would not be affected. He also has a proposal for a tax cut that he said would cover 95 percent of Americans. Obama has solidified his national lead in polls ahead of the Nov. 4 election and gained an edge in crucial battleground states in recent weeks as the Wall Street crisis focused attention on the economy, an area where polls show voters prefer the Illinois senator's leadership. The economic turmoil continued on Tuesday, with stocks tumbling for the second consecutive day in a sign the $700 billion bailout of U.S. financial institutions did not ease market concerns about the economy. Asked about a possible Treasury secretary under their administrations, both candidates mentioned Omaha's legendary investor Warren Buffett, a supporter of Obama. The debate featured little of the anger and aggressive attacks that have been featured on the campaign trail in the last week. Polls judged Obama the winner of the first debate two weeks ago, but Tuesday's debate was conducted in a looser town hall format where questions were asked by the audience -- a favorite setting for McCain and a staple of his campaigns in the battle for the party nomination this year and in 2000. About 100 undecided Nashville voters identified by the Gallup polling company posed the questions. 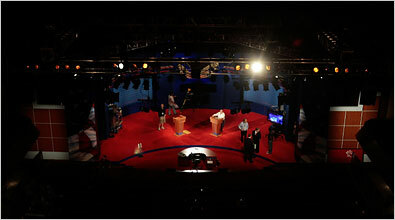 The candidates sat on stools and were free to roam the stage.